These a bloggers, they a crayzy! No blogging for a weeks and then a two come along together! Well dear reader the answer is quite simple; I've been stumped timewise. First came Easter, then school holidays (don'tya just love 'em) then I went and got ill! In my occasional less-delerious moments I had to try and get my VAT return done to keep Mr HMRC happy. So there! Today I thought I'd better push things forward a bit and, with a half hour to spare, extracted the wheels from the 108 DMU and the 04 Diesel and whisked them away to Mr Solloway for reprofiling. 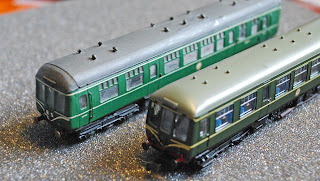 At the same time I took a look at some of the Farish coaches with a view to sorting the wheels out on these. Two coaches had replacement 2mm wheels in and I thought I'd try to find the original N wheels and get them reprofiled as demonstrated by Mick Simpson. Bad idea! One hour later I still hadn't found the wheels. My 2mm stores are now nicely organised however, so I guess ever cloud has a silver lining!